Zeus is the god of the sky and aerial phenomena in Greek mythology; his brother Poseidon is the god of the sea. 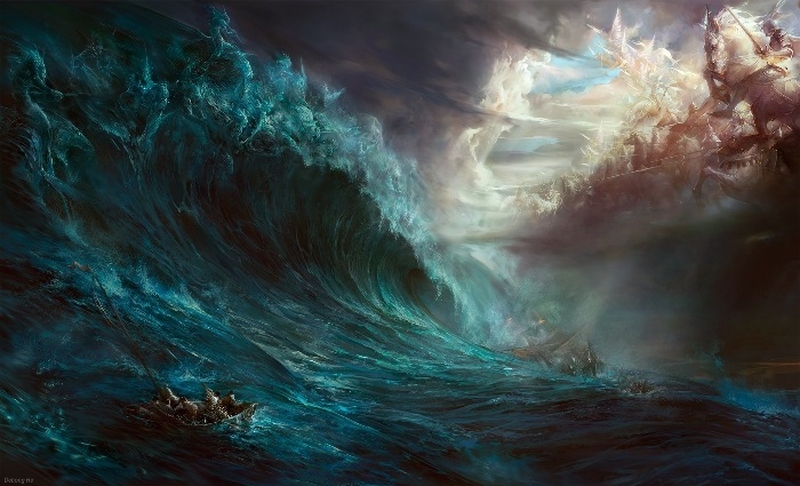 Poseidon is the elder of the two, but Zeus is more powerful and the ruler of all gods. Zeus' signature weapon is a thunderbolt, while Poseidon's weapon is a trident. Zeus and Poseidon's father is Cronus, the Titan who ruled the universe until Zeus overthrew him with the help of Poseidon and their other siblings. Once they were victorious, Cronus' children became the ruling gods of Olympus. Zeus, Poseidon and Hades drew lots to decide who would be the supreme ruler, and Zeus won. Because Zeus' realm is the sky and Poseidon's realm is the sea, they rarely interact in most myths. Poseidon is generally considered to be the most powerful god apart from Zeus; other gods and goddess generally leave him alone. One rare conflict occurred when Poseidon and Zeus' daughter Athena were fighting over a particular Greek city. Poseidon gave the city a salty spring, and Athena gave it an olive tree. The people of the city chose Athena as their patron deity and named their city Athens. Both Zeus and Poseidon have planets named after them. The Roman names for Zeus and Poseidon are Jupiter and Neptune, respectively. Server responsed at: 04/18/2019 10:58 p.m.